View 94, by Head Chef Antonio Sanzone, is a modern European restaurant located in the Riverside Quarter jetty in Wandsworth, and serves as a superb riverside dining location. Previously the Head Chef at Caffe Caldesi, Chef Antonio first started cooking at the age of 13. Learning to cook from his dad who was also a chef, he learnt to draw inspiration from the local Italian produce. With View 94, Chef Antonio has continued to stay close to his Italian roots. View 94 sits right on the bank of the River Thames, and therefore boasts stunning panoramic views along the river, stretching from Putney Bridge along to Wandsworth Bridge. The restaurant is split over two floors, with the ground floor being a lounge area serving a more casual bar menu, and the first floor being the restaurant proper. The design is modern and pretty minimalist, sparse even. It’s not a place to cosy up on during a dreary winter’s day, but instead would be to perfect place to linger during a spectacular sunny summer’s days. View 94 has a circular shape to it. Therefore you pretty much get good views from wherever you sit, especially as it has high, broad windows. There’s also an outdoor sitting area as well, again perfect for warm sunny days. 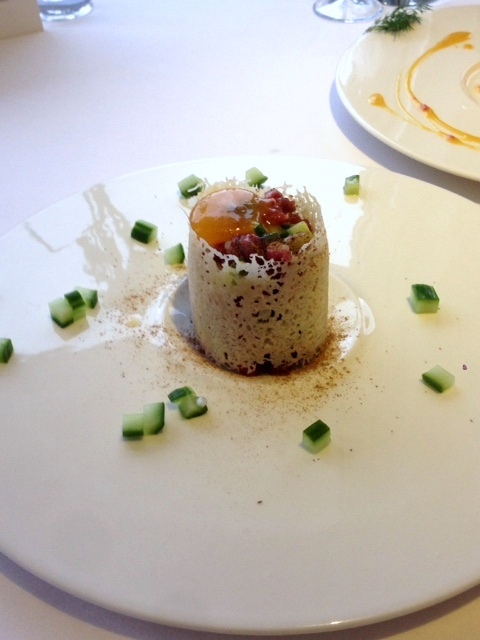 We started our lunch with a lovely beef tartare (£8) with cep dust, cured egg yolk and served in a well constructed Reggiano (parmesan) crown. As the waiter explained to us, no salt was used in the preparation of the dish. Instead the cep dust, a much loved Italian ingredient, acted as seasoning. The beef had been finely diced and was flavoursome, and the Reggiano crown added both further flavour and texture. 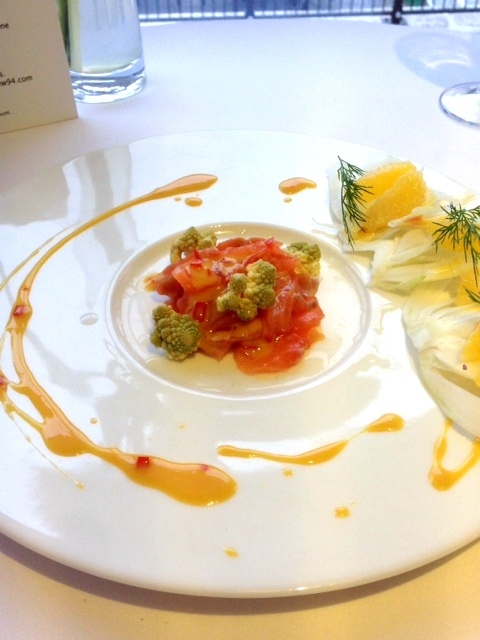 There were also capers running throughout the tartare to provide acidity to this lovely plate of food. Homemade smoked salmon (£8) was also very tasty. It had been lightly smoked so that you could still taste the sweet, delicate flavour of the salmon. Alongside the smoked salmon sat some pickled Romanesco and a refreshing salad of fennel and oranges with a chilli dressing. A main of lobster moka risotto (£22) served with spring onion puree, spicy tomato coulis and finished with shellfish cappuccino was a generous portion. 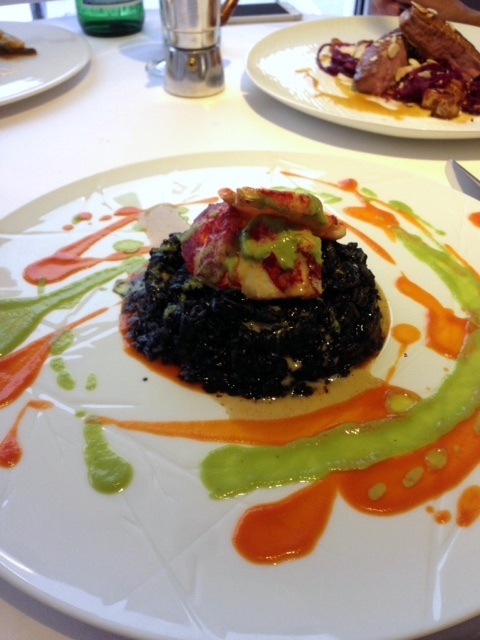 The lobster had been nicely cooked, and sat on a bed of black squid ink risotto. The risotto had a nice flavour running through it, creamy from the squid ink and not too fishy. However I would have preferred less cooking of the risotto so that the rice had more of an al dente bite to it. The spicy coulis was lovely, giving the dish a refreshing element, and the shellfish cappuccino was rich and smooth, providing an added dimension to the dish. 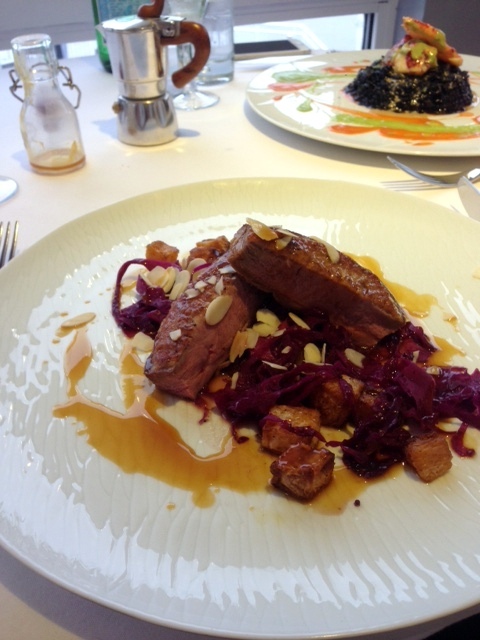 Pan fried duck breast (£17.50) was also very pleasant to eat. The duck was nicely cooked, pink and very tender, and it came with solid and trusty worth accompaniment of marinated red cabbage. In addition there was a sprinkling of almond flakes and a citrusy mandarin jus. To desserts, and a fondant black forest (£7.50) with vanilla ice cream and a sour cherry coulis was solid. The fondant was rich with a runny centre, and the coulis serving as a good acidic contrast to the chocolate. A second “Cappuccino” dessert (£6.50) consisted of an espresso cheese cake with coffee jelly fiordilatte ice cream, Italian meringue and gluten free cantucci. It was well made, creamy and smooth and with a good flavour. But overall I found the cheesecake a touch too sweet. I liked the food at View 94. Chef Antonio does well to draw out flavour from the fresh, seasoning ingredients that he uses. It’s not cutting edge cooking, but rather smart, steady, solid cooking with some modernity thrown in. The service was pleasant and in the round View 94 is a very pleasant place to eat. The views are spectacular with the setting working best on a nice sunny day. Although the food was good, View 94 isn’t a restaurant I would go out of my way for during the winter. But come the summer – no question at it. It’s a superb riverside dining location. 1) I enjoyed the lobster risotto, but would have preferred it more al dente. Prices: about £26 to £38 a head. Excludes drinks and service.